If you are a new arrival in our parish, then please go to our Welcome page for an introduction to life in the villages. Appointments are available to book in advance and there are also some appointments bookable on the day. The phone line is closed between 12.30 – 13.30 for staff handover and training. Please call between 11:00 - 15.30 to enquire about your test results as our reception staff will have more time to deal with your request between these times. This service provides transport to any resident living within the Parish to their medical appointments at a reasonable cost. Contact the Transport Administrator on 01435 873888 anytime. You will be asked to leave a message plus you contact details and someone will get back to you within 24 hours to arrange your transport. When you need a doctor quickly - If you need a GP or urgent advice when the local surgery is closed, ring the out of hour’s service NHS111 by dialling 111. Look out for the signs which indicate a defibrillator ; a heart with a lightning bolt in the middle. 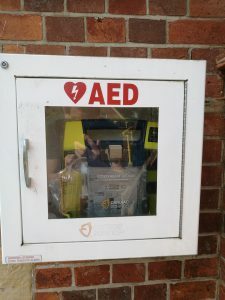 Defibrillators can be vital in saving the life of someone whose heart has stopped by giving them an electric shock. Each defibrillator gives spoken instructions on what to do and will not give a shock if it is not needed. So they are really easy to use. Incidents can be reported online or by phoning 101. Mayfield and Five Ashes are in the Wealden District of Sussex Police - follow the link for details of the team, the nearest police stations at Crowborough and Heathfield, and the latest crime figures. The 226 bus route operated by Wealdlink runs 3 times a day on Tuesdays, Thursdays and Saturdays (excluding bank holidays) from Crowborough to Mayfield and back between mid-morning and early afternoon. Stops are by St Thomas Roman Catholic Church and at the end of Southmead Close. There are male and female public toilets available at the bottom of car park in South Street Mayfield (postal code TN20 6DF). NatWest Mobile Banking is available in the car park behind Mayfield Memorial Hall on Mondays from 13:15 - 14:15. Parish councils are statutory local authorities set up under the Local Government Act 1972 and are the tier of local government closest to the people. They have a wide range of powers and duties which essentially relate to local matters, such as looking after community buildings, open spaces, allotments, play areas, street lighting, bus shelters, car parks and much more.